Having a routine is nice, but if you’re feeling stuck with your same daily work out plan try one of these unique workouts to spice it up! Aerial Yoga will deepen any existing yoga practice. So if you already love yoga, but are looking for a new challenge try aerial yoga. It works by practicing yoga poses while balanced just a few feet off the ground on a hammock suspended from the ceiling. This gives you more options than traditional yoga poses, one of which can have you ended upside down stretching. This new work out really has endless possibilities and will help you improve your existing yoga skills and balance, but in a new exciting way! For a new spin on your cardio workout, try a trampoline workout class. This is truly a full body workout that you will feel the next day! 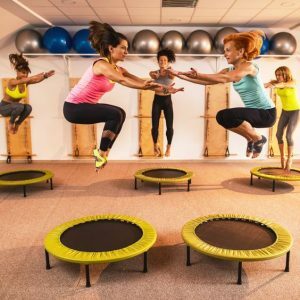 Jumping on a trampoline accesses an abundance of muscles in your body that are sometimes hard to workout, plus you keep jumping in-between the instructed moves and you are getting a serious but fun cardio workout. Only try this one with a well trusted friend or significant other as you will be fully relying on each other. 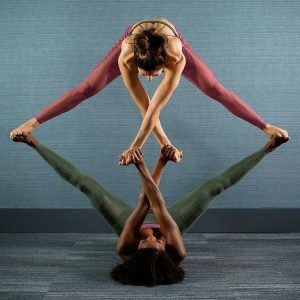 Acro Yoga is more than just an extreme balancing act, you will have to trust that your acro yoga partner, because your entire balance depends upon their balance as well. This also allows for more resistance and stretching than traditional yoga, not to mention it’s a huge bonding experience. Whether it is with your significant other or your best friend, you will both feel the burn and the connection.